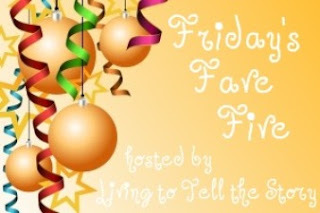 Thanks to Susanne at Living to Tell the Story for hosting Friday’s Fave Five. It’s a great opportunity to share our favorites of the week. If you’d like to join in, just visit Susanne and get the details. 1. A merry olde evening. I mentioned last week that our school’s Madrigal Dinner was coming up, and we enjoyed two wonderful evenings. I would love to share some pictures, but I was too busy to take any, so I’ll have to gather some and post them in the coming weeks. Twinkling lights and flickering candles mixed with the lovely strains of Silent Night transported me to that Judean hillside, filled me with wonder at the merger of heaven and earth that took place that night. 3. Friends who share my joy. I’m blessed to receive precious videos and photos of that sweet Aiden, and even more blessed to have friends who love to look at them with me. When I go in the faculty lounge at lunch, if I’m carrying my cell phone, one always asks, “Do you have new pictures?” They ooh and ahh properly over my grandson, and I love it! 4. Celebration. I just love the celebration of the season. Especially the music. I haul out the Christmas CDs, and play them over and over. They’re all I listen to in the car. And I’m excited because this is our celebration weekend. After working so hard on our production, we get to dress up and be entertained. We’re going to two Christmas concert / productions this weekend and a Christmas party. Looking so forward to it! 5. A Christmas quote. I’m partial to anything English before the 20th century; I’m just old school that way. And I love a quote that has so much packed into just a few words. This is a beautiful one. Read it a couple of times. Slowly. Then read it again. Stop after each line. Ponder. It’s lovely. Happy Friday to you. Joyous December! Sounds like a wonderful week of celebrating. Can't wait to see the pictures from the Madrigal Dinner. Enjoy your weekend! Thanks for sharing that quote. As you said, so much meaning in so few words! Great quote! sounds like a good week for you and a fun weekend ahead....and praise to God for the "anchors" in your life.....HE IS GOOD! Glad your Madrigal Dinner went well! And I love the quote! It really is overwhelming to think about the impact of the birth of that tiny little baby boy! God is good! I love the celebration of the Christmas season too and love the Christmas songs and productions. The Madrigal Dinner sounds so wonderful. Your husband sounds like mine. It’s so nice to have them as anchors, and to share that faith anchor with them as well. You have friends who actually ASK to see pictures of your grandson. What a blessing. Have a great weekend, Laura! I'm so glad your Madrigal went so well! I wish I could've been there! Great quote to meditate on, Laura. Great little One! That Madrigal dinner sounds lie so much fun! Glad it went so well. I am glad my husband is well-grounded, too, and keeps me anchored. Have fun at your parties and such! Friends who love what we love are wonderful indeed, it sounds like your life is full of them. Love the quote again, captures the essence of the season. Isn't it great when our friends recognize what cute grandbabies we have? You have lots going on...good thing you're so organized and have that sweet husband! It is a blessing to have a husband that turns a chaos into calm. I have one also so knew what you spoke of. We often have too many things going on, we are gifted that way, lol. Grand babies are special, even pictured on phones.